Annie Besant was a socialist and woman’s rights activist, as well as a writer. She was a wife and mother, a university graduate, and the second president of the Theosophical Society. She did most of her writing after meeting HP Blavatsky and becoming a theosophist. She later worked with Mahatma Gandhi while she lived in India. The Theosophical Society in America is a membership organization, branch the International Theosophical Society with headquarters in Adyar, Chennai, India. This website offers online programs, membership, national and regional events, and study group materials. Formerly known as the Canadian Federation of the Theosophical Society, the Canadian Theosophical Association works in conjunction with the International Society and offers documents in both English and French on their website. 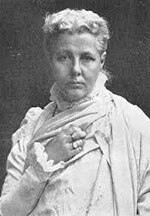 Amazon Synopsis: Annie Wood Besant (1847-1933) was a prominent Theosophist, women's rights activist, writer and orator. She was born in 1847 in London into a middle-class family of Irish origin. She fought for the causes she thought were right, starting with freedom of thought, women's rights, secularism (she was a leading member of the National Secular Society), birth control, Fabian socialism and workers' rights. Soon she was earning a small weekly wage by writing a column for the National Reformer, the newspaper of the National Secular Society. She was one of the leading figures in Theosophy. Soon after becoming a member of the Theosophical Society she went to India for the first time (in 1893). She devoted much of her energy not only to the Society, but also to India's freedom and progress. 1915. Partial Contents: Origination of Monad; Formation of the Atom; Spirit Matter; Sub Planes; Consciousness; Peopling of the Field; Permanent Atom; Group Souls; Unity of consciousness; Mechanism of Consciousness; First Human Steps; Consciousness, Self-Consciousness, Human Consciousness; Monad at Work; Nature of Memory. Publishers Note: This book was originally published prior to 1923, and represents a reproduction of an important historical work, maintaining the same format as the original work. We believe this work is culturally important in its original archival form. While we strive to adequately clean and digitally enhance the original work, there are occasionally instances where imperfections such as blurred or missing pages, poor pictures or errant marks may have been introduced due to either the quality of the original work or the scanning process itself. Despite these occasional imperfections, we have brought it back into print as part of our ongoing global book preservation commitment, providing customers with access to the best possible historical reprints. We appreciate your understanding of these occasional imperfections, and sincerely hope you enjoy seeing the book in a format as close as possible to that intended by the original publisher. From the Book: Now, what is this Noble Eightfold Path? It consists of eight precepts, or as we may call them, eight great truths, each one of which applies to human life, each one of which is intended to shape human destiny; and taken one by one, and understood and practised, human evolution would be rapid and secure. The first of these great truths is Right Knowledge; the second, Right Thought; then the third and fourth, that grow out of Right Thought - Right Speech and Right Activity; then, with regard to the outer world, Right Means of Livelihood; then, Right Exertion; then Right Memory; and, lastly, that highest achievement, Right Concentration. 1923. This book is another in the series Essays and Addresses. Found within are the essays entitled: spiritual life for the man of the world; some difficulties of the inner life; place of peace; devotion and the spiritual life; ceasing of sorrow; value of devotion; spiritual darkness; meaning and method of the spiritual life; theosophy and ethics; supreme duty; use of evil; man's quest for God; discipleship; perfect man; and the future that awaits us.